3DS Buzz Reports that the name of the game is actually Kirby's Return to Dreamland, contradicting earlier reports of a name change by Go Nintendo. They have also linked to the official Nintendo Website confirming the name. According to a recent Nintendo Power Survey, Kirby Returns to Dreamland underwent a name change. It is now called Kirby: Return to Dreamland. Could name changes for other titles be far behind? Super Mario Land 3D anyone? Or how about Mario Kart 3D? I actually liked Kirby Returns to Dreamland. Straightforward and casual. The new version makes the tone more serious. I also like Mario Kart 7 and Super Mario 3D Land. I really hope they don't change them. Super Mario Land 3D would sound terrible. Sounds like a remake of a mediocre game. I do prefer "Returns", but it's not a huge change. Game still looks great, and the title is still better than "Kirby Wii". I don't agree with your Super Mario 3d Land opinion but Kirby: Return to Dreamland sounds way more serious than Returns to Dreamland. "Kirby Returns to Dreamland" sounds sort of like the title of a story more than a video game. I kind of like both, but I think I might prefer the current one. @casper884 Kirby: Return to Dreamland sounds way more serious than Returns to Dreamland. 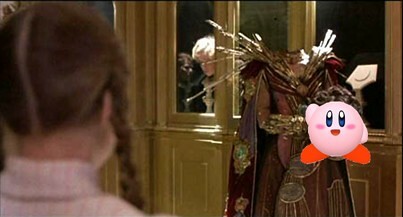 Kirby: Return to Oz....I mean Dreamland. Maybe I'm crazy but I don't think the S makes a whole lot of difference. And I guess the only positive thing about Super Mario 3D Land is that they aren't using the word "New" anymore? "New" sounds great upon release, but a year or two later? New Super Mario Bros. isn't exactly new. Maybe they should've called it "NewER" Super Mario Bros.? "Let's see, what would Billy want for his Birthday... oh! NEW Super Mario Bros.! It's NEW!!! He'll love this!" @Secret_Tunnel Haha, yeah, I understand that. It'll just sound sillier as time goes on. From a marketing perspective, yeah, it's pretty genius. I wonder when they'll do "New Wii Sports." Or maybe they could put "New Wii Sports" on the DS, and then make a Wii came called "New Wii Sports Wii." Man, I should've went into marketing. I like Kirby Returns to Dreamland. Super Mario Land is freakin' sweet. That game is a blast, and one of my favorite platformers ever. @GameDadGrant My feelings about the game aside, I think Super Mario Land 3D would be a bad title (even if it sounds better than Super Mario 3D Land). Nintendo's had enough trouble selling 3DSes based on the fact that people think its just a marginal upgrade of the old DS, and I think SML3D would suffer from the same problem (sounding like a remake of SML). And that might be the reason they're not calling MK Mario Kart 3D either, really. Super Mario Dimension. I mean, where else can you go from space? To another dimension, obv. Don't you think that sounds a bit The Matrix-ish? With a title like that, I fully expect Mario to be dodging Bullet Bills in slow motion and jumping over 1000 kilometer gaps. Too sci-fi-ish. Oh, god, I just had a flash of Super Mario Wii U. Please God, don't let them turn the next home console Mario into something like this! @nate38 & @casper884. We already have Super Mario Galaxy, so why not Super Mario Universe. Surely this is the title for Mario Wii U.